I was very excited to receive the my review of the New American Haggadah, especially after this piece in the New York Times, which made me giggle a little. And then I opened it. It is gorgeous. It's hardcover, with beautiful illustrations. The translation is very interesting and literal, and the commentaries are creative and actually add something new to the text, which I truly appreciate. There's a very interesting timeline of Jewish history running throughout the book. It is a fantastic study document, and I recommend it to all Seder leaders. You will learn something new, you will gain different and lovely insight into the Haggadah text, and you will be able to enhance your family's Seder with these ideas. That said, I cannot imagine ever using this Haggadah at my family's seder. Firstly, there are no transliterations. Its sheer size and bulk make it really unreasonable to use as a family Haggadah. The commentaries are on their own separate pages and you have to turn the book to read them, and the timeline also requires you to turn the book, but the opposite way! I know that much has been made of the design of this book, and it is so beautiful, but it really doesn't seem like it would be a very realistic book to use during a Seder, itself. So, I definitely recommend that this book grace your shelf. It is beautiful to behold and there are new insights, definitely. But I recommend that you find a different Haggadah to use at your Seder table, if you are still looking. 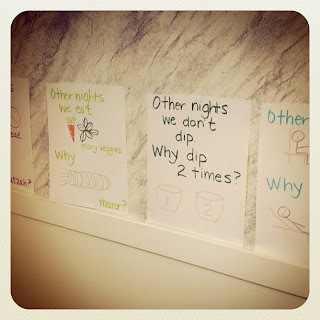 What Haggadah does your family use? So it's that time of year when I'm using up the chametz. And I am trying so hard not to buy any more. So when Sam asked for French Toast, I was so excited to remember that I had a challah in the freezer just begging to be sliced up. I love French Toast, but I just don't always have time to stand at the stove and flip the bread. (Um...4 kids!?) And many years ago, I discovered the overnight baked French Toast deliciousness. But sometimes, I don't plan ahead...and then I figured out how to make baked French Toast without the overnight part and...voila...French Toast is a basic, easy to make meal! Spray a 9x13 glass baking dish with cooking spray and then put butter and honey into then pan. Heat in oven until butter melts and honey is bubbling, about 8 minutes. Remove from oven and stir well. While it's heating, in a large wide pan, whisk together juice, eggs, spices, and salt. Dip bread in, turning it once to coat it well, let it soak about 2 minutes per side, then carefully set each piece of bread into the honey-buttered pan. Bake for 20 to 25 minutes, or until well-browned. Before serving, flip over each piece so the honey-butter side is up. It smells and tastes amazing. What do you do to use up the chametz in your house? Looking for #BlogExodus? Check it out over here. What a fun project this is turning out to be! I was hopeful that #BlogExodus would inspire some new bloggers or some "retired" bloggers out of retirement....and it has! oh, I almost forgot my own posts! Are you posting for #BlogExodus and I missed it? Let me know in a comment! 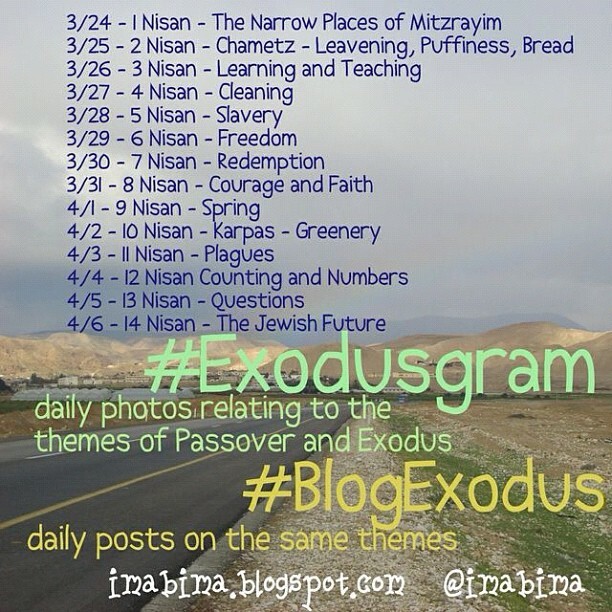 And, very cool, I'm really enjoying the different ways that people are interpreting #Exodusgram, the photo project. You can see some of them here, using Webstagram and others at a Twitter search for #Exodusgram. Make sure to check out the Bible Belt Balabusta's creative Lego Exodusgram pics! Are you doing Exodusgram and I've missed it? Help me out! I didn't tell them it was gluten free pasta. It was a little gummy while cooking, and it definitely isn't the same as the "regular" pasta that I usually make, but my kids ate it with no complaints at all! My brother-in-law, who often eats gluten-free products, said that it was quite good gluten-free pasta. High praise! Now, if you've been around here before, you've noticed that I'm a baker. So I don't usually buy mixes like this, on Pesach, or ever! But how could I not try it out? I must admit, it smelled like matzah meal and I didn't have high hopes as I mixed it up. But my kids ADORED it. In fact, Sam asked if I would make it for his birthday next year. Which doesn't mean that he's going to get it for his birthday. But I thought that was amazing praise. It actually tasted quite good...like real red velvet cake! Impressive for a Pesadik baked good that came out of a box. As you can see from the picture above, we also got some White Chocolate Covered Matzo - which we thought was too sweet, and some Mediterranean Matzos, which I think will make awesome Matzah Pizzah. The other notable thing in the package were the Guiltless Gourmet Crunches - a sweet, crunchy cashew snack food that was really delicious. I would definitely eat that year round. Thank you to Manischewitz for the samples! So....as you head on out to do your Pesach shopping, these are some of the new offerings you might find on your shelves! What new products are you going to try this year? P.S. 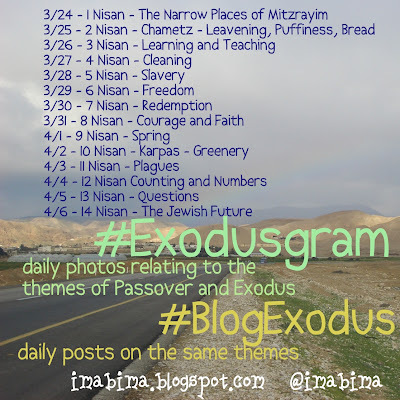 If you're looking for #BlogExodus, head over to my other blog, rabbiphyllis.blogspot.com, and if you're looking for #Exodusgram, head over to my tumblr, imabima.tumblr.com. 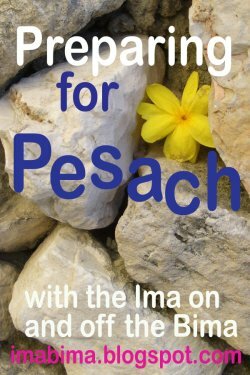 There's always a lot to get done to prepare for the holiday of Pesach. Not only do we have to get our homes ready for the week of leaven-free dining, there's an important spiritual aspect to preparing ourselves for the experience of the Exodus. Luckily, there are a couple of weeks prior to Passover in which to get ready! A few years ago, I participated in Tweet the Exodus. It was one of the most fun online projects I've ever participated in! I'm not sure we could reprise it even if we wanted to! So onto new and different projects. 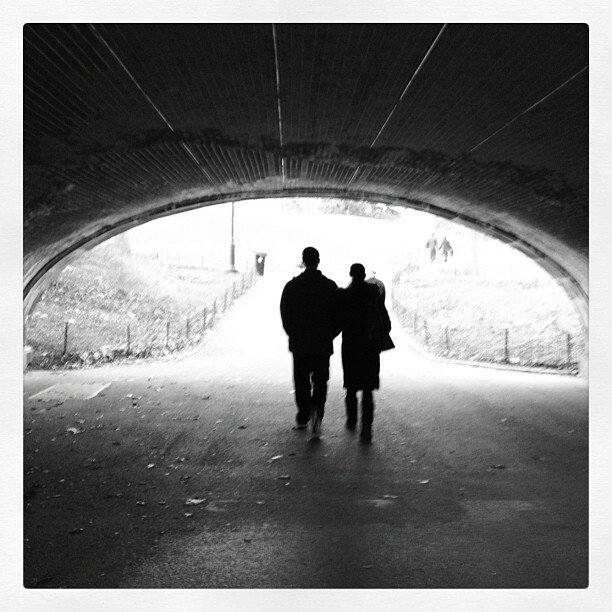 This year, I'm inviting YOU to join me (yes, you. The person reading this post...friend, family, colleague, blogger, reader...) in two projects during the first part of the month of Nisan, the month in which Passover falls. You can do one or both...or just jump in at your whim! The second is a little more...blurry. Or...open to interpretation. 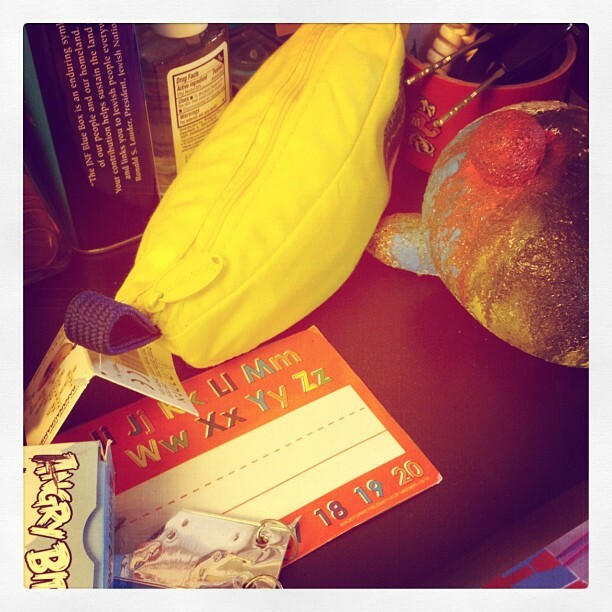 I'm totally into Instagram (I'm imabima, of course) on my iPhone. I have noticed all sorts of fun daily challenges on Instagram, and I've decided that I'm going to take photos related to these themes. I think this will be far more challenging than merely writing about the themes and I'm hoping that it is a fun challenge. Also, if you don't have a blog or don't feel like writing...take a picture instead! (And you don't have to use Instagram to share your photos, you can share them on Facebook, Pinterest, Twitter, Tumblr (I'll admit, I have one but I don't use it, any ideas? )...whatever makes you happy!) Whatever you do, don't forget to tag it with #Exodusgram so we can all share. The themes are totally up for your own interpretation! I tried to think broadly about what the general themes of Pesach are, and how they would translate into blog posts, photos, etc. Feel free to grab the picture above and share it....and use it in your posts, etc. I didn't even know what a palmier was. My friend Barrett mentioned that she had made them for Purim, using Tina Wasserman's recipe. I looked it up...and, oh my, they sounded delicious. Thank goodness for Google, since I could look it up without feeling stupid. Oh, but now I've told all of you....okay. Well... you love me anyway, right? Plus, I had two packages of puff pastry languishing in my freezer. Oh, and they do taste amazing. Purim is all about delicious. Tina's recipe is here. It was super easy. My recommendations - it took longer that 30 minutes to defrost the puff pastry to be workable. Almost an hour. I thought I'd be able to roll out hamantaschen while waiting for them to freeze, bake, etc, but it seemed silly to clean up all that sugar on the board so I couldn't really multi-task. They baked for much shorter than the time suggested, only about 8 minutes on the first side and 3 on the second side so watch your oven. 2 out of 4 of my kids loved them. I am a big fan and planning to make them a new part of my Purim baking routine! I'm not giving up on hamantaschen though.